Vocals and instrumentals combine in this very popular more recent back catalogue offering, which features the vocals of classically-trained singer Susanna. The tracks are more obviously contemporary than some of his earlier albums, and the rhythms and arrangements introduce pop elements to embellish Asher's signature spiritual/folk style. As so often, there is an exotic blend of melodies... with hints of the Celtic and the Middle-Eastern in the Euro-pop treatment. Genre-wise, this is new-age like Enigma are new-age. Listen out for the epic 'Return to your soul' which closes the album. 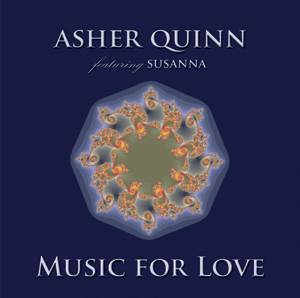 Originally recorded in 1999, Asher Quinn's Music For Love is a remarkable New Age album that succeeds in being both soothing and compelling. Despite being recorded over a decade ago, the album sounds fresh and polished, likely due in large part to the involvement of producer James Asher. Asher is a substantial name in the New Age music industry as both a multi-instrumentalist and producer. Here he lends his musical talents to a variety of percussion instruments in conjunction to producing the album with Quinn. At only six tracks long, Music For Love still contains a lot of content considering the shortest song on the album is five and a half minutes, and the rest of them averaging around eight to nine. Though the longer song lengths are typical of the New Age genre, the big difference with Quinn's work is that none of the songs sound drawn out to excessive duration. Quinn's arrangements are engaging to the listener, but they don't sacrifice the relaxing and peaceful quality that his music seeks to exude. The percussion for example is kept soft and avoids the heavier sounds of a drum kit in exchange for a variety of softer drums, shakers, triangles etc. The gentle sounds keep the music subdued, but the variety combined with the ethereal keyboards and lead guitar work give layers of texture to listen to for the extended runtime of the songs. The first track, 'Heal Your Heart', captures many of those qualities right away. Vocalist Susanna sings highly and lightly, 'Heal your heart/let the arms of creation embrace you...' in a manner akin to Elizabeth Fraser of Cocteau Twins. Susanna's voice alone is incredibly engaging, but it blends especially well with the backing keyboards that Quinn saturates the track in, sounding like a softly singing choir. The element that connects it all together is the guitar work from Phil Thornton, who seems to be drawing on a sound similar to that of Mike Oldfield with his lead playing. When Thornton plays, it offers enough variation to the sound to keep the track from sounding like its revisiting old ground. In similar fashion, this playing also keeps the nine-minute long 'Goldenheart' sounding fantastic. Quinn's vocals appear here as well while Susanna sings harmony. Quinn is not the same caliber trained vocalist that Susanna is, but he sounds natural, pleasant, serene, and pure. The harmonies between the two vocalists are the most entertaining parts of the song as Susanna's voice sails above Quinn's while he holds down a more grounded melody to her lofty singing. The third track, 'Free Yourself', is again sung blissfully by Susanna, but the percussion from Asher is more noticeable in both the left and right audio channels of the mix. You can hear the soft, driving tempo more prevalently because the drums are separated enough to hear them each distinctly. This, the shortest track, serves as a good transition to the longest song, 'Life Is Only For Love'. By now, the formula for the songs is apparent, but it doesn't wear thin. The themes from 'Goldenheart' are revisited but Quinn sings elegantly of the beauty of love and finding peace in a kindred soul. What he may lack in vocal range, he makes up for in emotion. Susanna shares lead vocal duties in different parts of the song, resulting in an eleven-minute epic between the two vocalists. 'Angel of the South' follows next and is primarily an instrumental aside from some background vocals from Susanna. Largely the song's voice is the picking of Thornton, which takes on a greater and more central role. Some of the parts sound as if they were Spanish guitar inspired and the resulting licks are beautiful. Finally, 'Return To Your Soul' closes things out with a wonderfully arranged piece that features layers of keyboards beneath Quinn's acoustic strumming and vocals that come later into the track. The sound is actually slightly darker than the rest of the album with the keyboard tones being somber, but no less calming. It's not until the song's later third, where Susanna's vocals kick in that the song sounds more uplifting and ends on the pleasant note that the album first started on. As previously stated, Music For Love is both soothing and compelling. Unlike other New Age recordings, Asher Quinn has created something here that is capable of transcending genre and offers something to enjoy for music fans in general. He, James Asher, Susanna, and Phil Thornton may have recorded this in 1999, but it still holds up today as a timeless example of quality musicianship and songwriting. I really love your music since a lot of years, and I'm a musician percussionist and a painter. I've played alone lots of nights and sweet mornings with your Music for Love. Hi Asher, I got a copy of Music for Love a year ago, and loved it. Recently, I got an incredibly strong pull to come back home from Perth to London for a bit... just on my own. On the plane from Bangkok to London I relaxed and slept. I watched a Gangaji video on my i-pod and listened to 'Return to your soul'. Something started to happen to me, an incredible sweet spring of pure, radiant, heart joy energy started to flow out of my chest in waves. My trip around beautiful England was the best time in my whole life. Driving round in my hire-car I would begin every trip listening to 'Return to your soul'. I called it my theme song. Thank you for your beautiful beautiful music, Asher. After trying for ages I have finally added Music for Love to my Asha collection. It was well worth waiting for... the distribution in Canada is poor. Your magnificent music deserves more exposure. Music for Love would make a great Valentine's Day gift. Every track is beautiful, and I find myself listening to the album over and over again. Music for Love is absolutely wonderful. I can't stop playing it. I love the sound of your voice as well as the music and words. An aside... recently I was introduced to some new family in-laws. Their 3-year-old son is named... Asha! Couldn't get over it! I am relaxing at home listening to one of my favourite tracks 'Life is only for love'. Your music is simply the best, music to feed the soul. I'm sitting here enjoying Music for Love which is stunning. I love the words.